Do you have any food obsessions with things that you haven’t even eaten yet? Maybe you see a picture, or hear about a dish that you haven’t even been in the same room as, but you build it up in your mind as the greatest thing ever? This happens to me all the time. Case in point: potato pancakes. It was in elementary school when I first heard about potato pancakes. Everyone had to create a poster on their favourite traditional food. Mine was on noodles, of course. 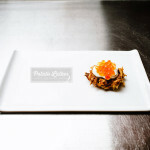 There were tonnes of interesting sounding dishes, but the one that stuck out to me was latkes. I love potatoes and I love pancakes so I got pretty excited. It’s too bad that the teacher didn’t have everyone bring in food so we could try it because as a 7 year old, my access to potato pancakes was severely limited. Over the years, potato pancakes became one of my food unicorns: something you know exists, but you never happen to be luckily enough to see in the wild. They never appear on restaurant menus and I’m not exactly the type to invite myself to a Hanukkah gathering just to eat the food. 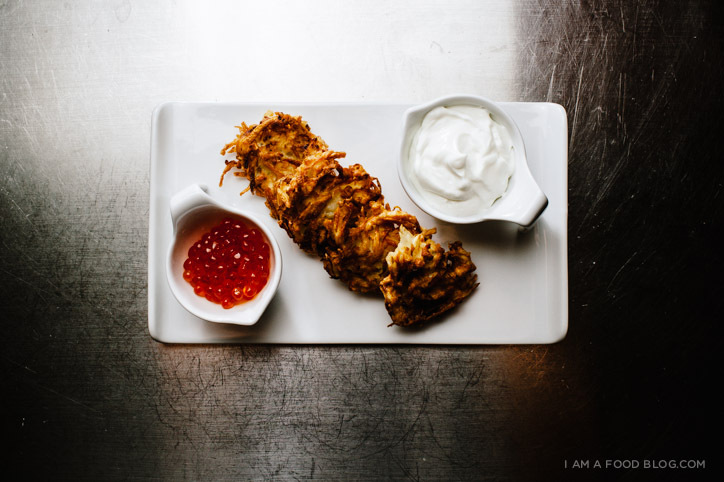 There’s a serious dearth in potato pancake availability, at least here in Vancouver. It was clear that I had to take matters into my own hands so I did. 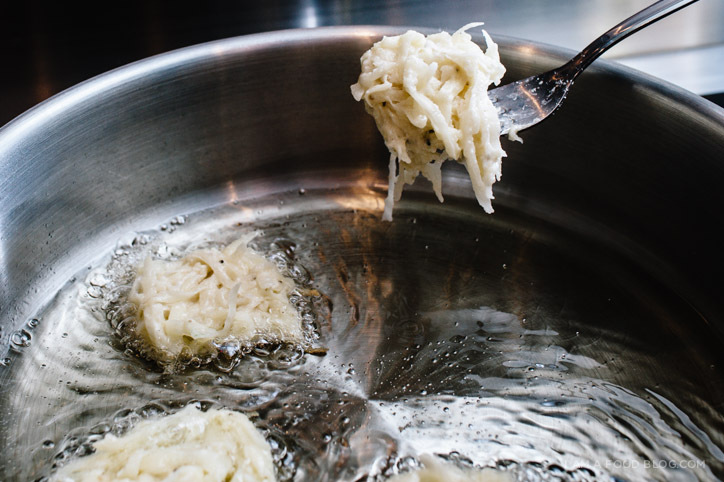 I started making potato pancakes in my teens and I haven’t stopped. There are many, many potato pancake variations out there, but for me, the best are made with coarsely ground potatoes and onions, barely bound together by a bit of flour and egg. 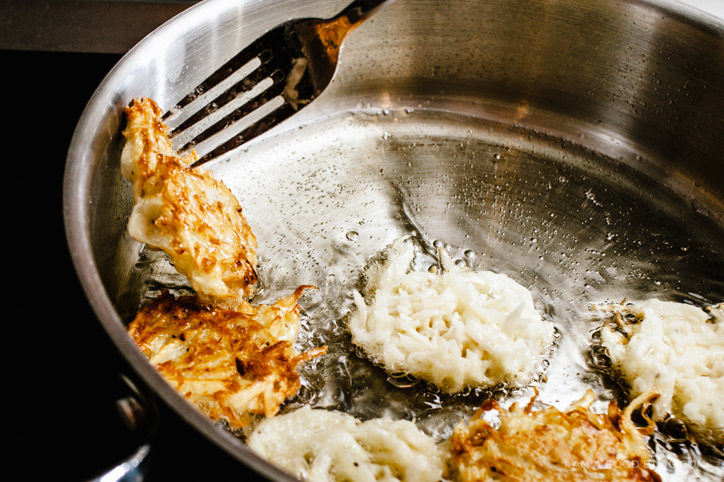 These potato pancakes are crispy, crunchy and creamy. 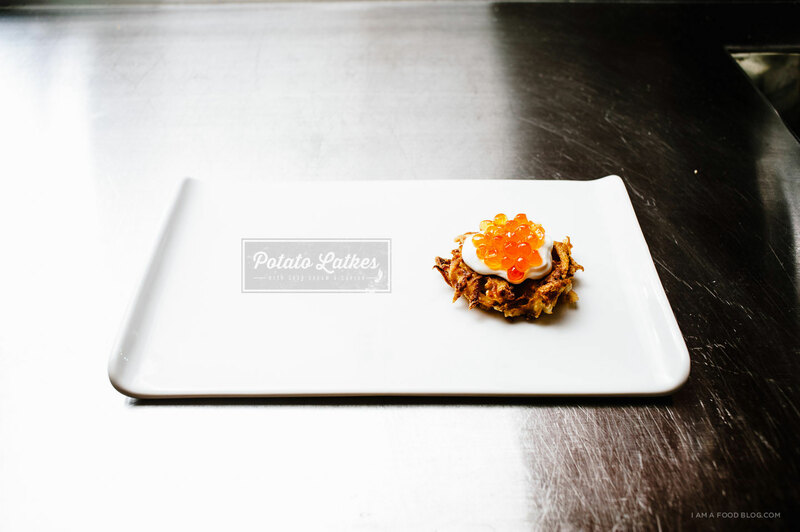 Top them off with some sour cream and caviar and you have something that will far exceed your wildest potato pancake dreams. 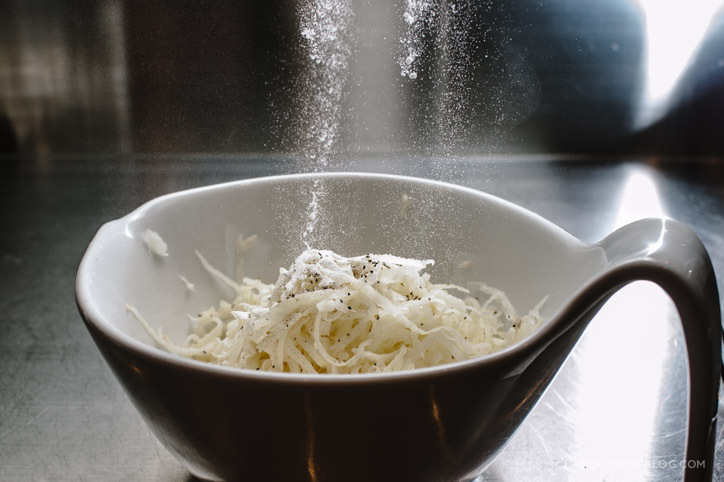 Whisk together the flour, salt and pepper. 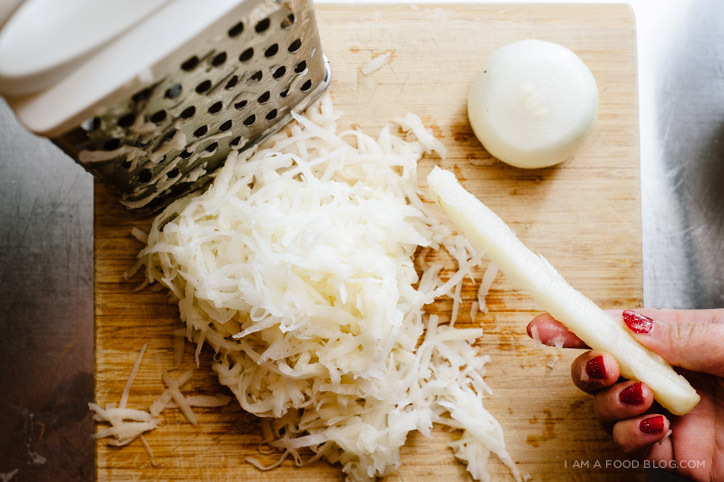 Toss the potatoes and onions in the flour to coat and then add the lightly beaten egg and stir until evenly coated. In a medium skillet, heat up 2 tablespoons of oil until hot and shimmery. Drop the potato mixture by the tablespoon and flatten. Cook over medium to medium-high heat until edges are crisp and golden, about 1 1/2 minutes. Flip and cook the other side until golden, about 1 minute. Drain on paper towels. Continue pancaking until potato mixture is done. Top pancakes with sour cream and caviar, if desired. These are straight up fabulous!! These are gorgeous, Steph! Though your awesome red nails distracted me for a minute! Oh, I love latkes, too. I like them minimal, like you make them here, but sometimes……………. shredded Spam, too! Bravo, these look amazing. You’re out of control in the best way possible. You are not alone. I often daydream and obsess over food I’ve never actually tasted. These look awesome! I’ve said it before, and I’ll say it again… your photos are STUNNING! I’m sitting here looking through this post at every image in awe, you have such a talent for capturing gorgeous food. Many holiday celebrations in our extended family include latkes, so here is my suggestion for the ultimate latkes. 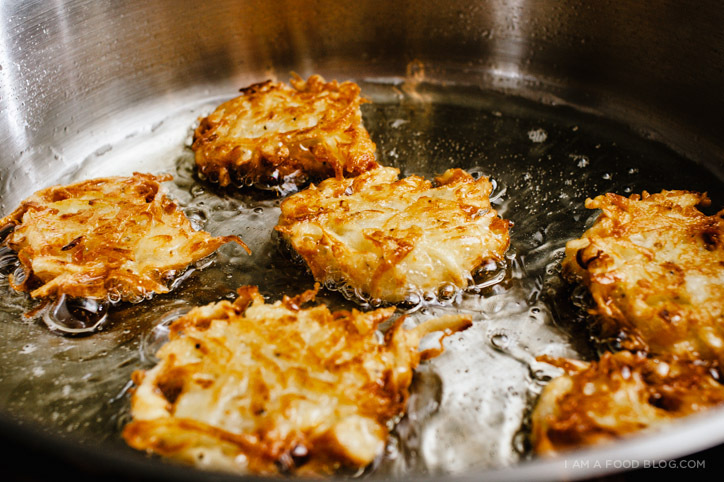 Use a combination of yukon gold potatoes and russet(5), 1 onion, 1-2 eggs, matzo meal and fry ONLY in peanut oil.